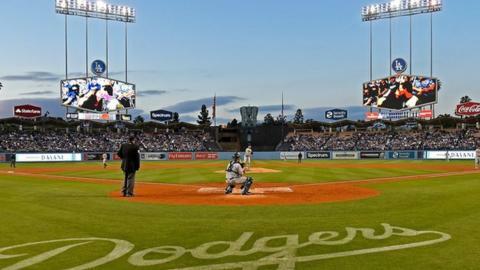 A 79-year-old grandmother died after a baseball hit her during a game between the LA Dodgers and San Diego Padres, a coroner in the US has said. Linda Goldbloom was celebrating her birthday and 59th wedding anniversary at Dodger Stadium on 25 August. It raises new safety issues for Major League Baseball (MLB). Mrs Goldbloom's death came during the first season in which all 30 MLB teams had used protective netting extending from behind the home plate to at least the far ends of both dugouts to protect fans in vulnerable sections of stadiums. However, Jana Brody, Mrs Goldbloom's daughter, told the Washington Post that those measures had not prevented her mother's death, which was caused when a ball hit by a San Diego player travelled over an area protected by netting and struck her on the head. "It was pretty rough. This was definitely not a ball that could be dodged or caught," she said. The Los Angeles coroner's report, obtained by ESPN, reveals Mrs Goldbloom died due to "acute intracranial haemorrhage due to blunt force trauma". In a statement, the Dodgers said: "We were deeply saddened by this tragic accident and the passing of Mrs Goldbloom. Although Mrs Goldbloom's death is the first in nearly 50 years that has been directly attributed to a foul ball, hundreds of fans are struck every season.